Klaus-Dieter Boehm, Editor German Salve.TV, Under Scanner! Why would a German TV editor be investigated by Thüringen State Media Authority? Was it for a financial fraud, which big banks in the Western World have made it a habit to commit? [After rigging Forex, Gold, LIBOR/EurIBOR, possibly Sovereign Bonds Markets, only the Equity and Corporate Bonds Markets are left out at the moment for lack of evidence; and No one has gone to jail despite such colossal financial frauds, save except paying hefty fines that were but a fraction of the ill-gotten gains]. No! ; Financial Crime is no longer a crime in the surreal world of “Zero or Negative Interest Rates Policy [ZIRP/NIRP]” contrived by US Federal Reserve, +Europäische Zentralbank, and Bank of Japan; provided the Crime is Big Enough and the Criminal is Too Big To Jail. The “crime” of Editor in Chief of Salve.TV, Klaus-Dieter Boehm, was piffle in comparison, thus meriting both investigation and may be “suitable” punishment too if he is found to have crossed the “Line“. The “Line” in question here is the Freedom of choice given by him to his TV audience to judge for themselves where the truth lies. He chose to air programs from +RussiaTV, some of them were about the Ukrainian Crisis over which Obama/ USA have arm-twisted Germany and France to impose economic sanctions on Russia that were targeted to cripple it. Russia had no option but to retaliate with its own sanctions that have hurt Germany, Italy, France; though have had little effect on USA. 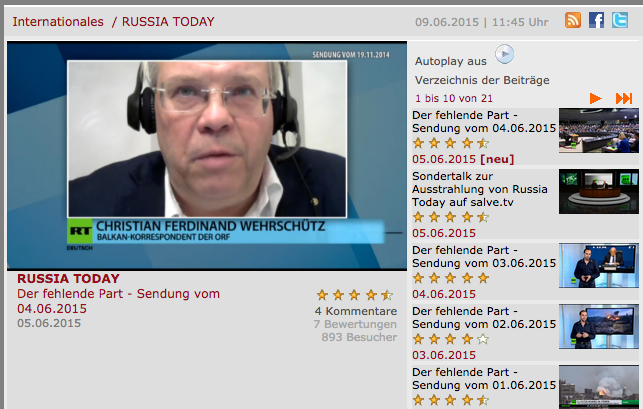 One of the worst affected regions by Russian sanctions in Germany is Thüringen State,where the Salve.TV operates. That shows the keen interest in this region over the Ukrainian crisis and the desire to know the truth. That is precisely the thing, The Truth of the Ukrainian Crisis, which the German authorities do not want their citizens to learn it would appear. The airing of RT-Deutsch’s Program that drew the authorities attention was called “Der fehlende Part [The Missing Part]“. Those who understand German may like to check out the link to decide for themselves if the program rings true or is sheer propaganda. The viewers reactions [Google Translation] were one of relief for having finally got to see another point of view away from the usual uniformly same stale stories that make up the staple diet of mainstream Western Media. Russia TV’s editor in Chief, Margarita Simonyan, had this to say about the controversy. This is precisely the point. Isn’t Germany about Freedom, Democracy that includes Right to Free Speech and Right to be Heard [not obligation to agree]? Aren’t these the “European Values” that Ukrainian President, Petro Poroshenko, avowedly wants to embrace so eagerly? Then, why are they denied to the German people, the Thüringen state audience of Salve.TV?